With the rise in influencer marketing, we are also seeing an increase in the number of influencer marketing platforms available in the market. These platforms have made it easier for marketers and brands to execute and manage their campaigns effectively. Influencer marketing comes with a multitude of challenges just like with other marketing channels. One of the biggest challenges, according to Econsultancy, is finding the right influencers. Influencer marketing platforms help overcome this challenge by minimizing the need to conduct a manual influencer search on Instagram. But before you conduct an influencer search on any platform, you should have a clear idea about what you need in an influencer. What kind of subject should they specialize in? Should they necessarily be an expert in the field or someone who is deeply passionate about it? How many followers should they ideally have? Based on what you’re looking for in an Instagram influencer, you can start a search on the platform of your choice. It would be best if you can find one that has plenty of filters to narrow down your search more easily. The advanced search features of Influence.co are an excellent option, as you can conduct searches based on follower count, engagement rate, location, total reach, age, gender, and more. Otherwise, there are also influencer marketing platforms that can automatically match you with the best influencers for your brand. The Revfluence “Quickmatch” feature is an excellent option for this as you get automatic recommendations of influencers who match your preferences. You’ll be able to see details such as follower count and average likes to filter the results. How can you be sure that the influencers you like will be able to reach your target audience? You can’t just manually go through each and every Instagram follower your influencer has. But some influencer marketing platforms make this job easier by providing you with influencer audience insights. Platforms like HYPR provide you with detailed audience analytics that can help you understand what kind of audience an influencer can reach. 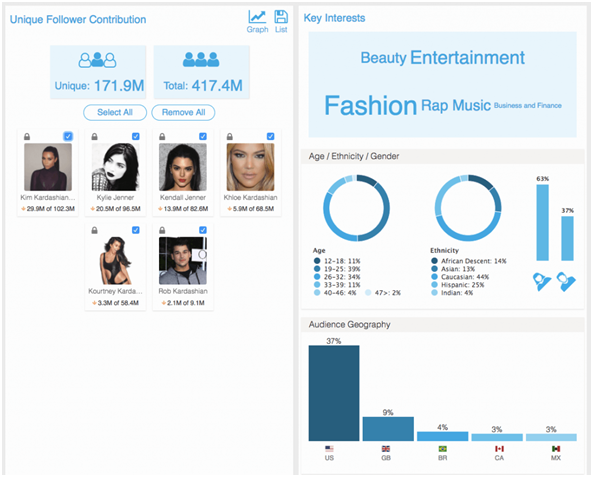 You’ll be able to see details like age, ethnicity, gender, and geographic distribution of each influencer’s audience. This will help you select the right influencers who can reach your target demographics on Instagram. According to the previously-cited Econsultancy study, one of the top three influencer marketing challenges is attracting and engaging influencers. Since influencers have so many brands approaching them for collaborations, it can be difficult to connect with them. Your outreach attempts could easily be overlooked among the horde of messages from other brands. Plus, you may have a hard time manually searching for their contact information and sending outreach emails individually. For this, you can use influencer marketing platforms to assist you with your outreach efforts. Many of these platforms provide you with the influencer’s contact information. Some even let you send out outreach messages right from the platform. And influencers are more likely to take notice of messages coming from a reliable influencer platform that they’ve signed up with. Platforms like Grin provide you with proven outreach templates that help you to engage influencers more effectively. Brands may reach out to many influencers at one time. So it’s difficult to keep track of who has responded and who has accepted or declined your proposal. And with everything else you have to manage, it is that much harder to keep track of your outreach efforts. There are several influencer marketing platforms that can effectively help you manage your influencer outreach. The previously-mentioned Grin tool gives you real time updates on which influencers have accepted your proposal. 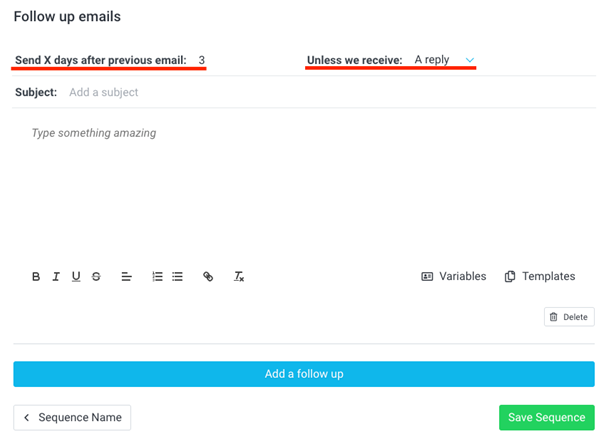 You can also automate follow-up emails in case influencers haven’t responded after a certain amount of time. During your initial contact with influencers, you will likely provide them with a campaign brief that tells them exactly what you need from the campaign. And since you want them to have creative control over the content for the best results, you shouldn’t give them too many instructions or restrictions. Then it’s up to them to create what they want to create for you in a way that their audience will resonate with. However, this doesn’t mean you should overlook any content that’s undesirable or any content that fails to abide by the FTC guidelines. This could significantly set your campaign back and may even result in unexpected expenses or fines for your brand. So while you need to provide influencers with creative freedom, you should still carefully review the content that they create before they publish it. Influencer marketing platforms make this task easier by enabling you to review influencer-created content for your campaign. So you can ensure that each piece of content created for your campaign meets your brand’s expectations and the FTC guidelines. Giveaway campaigns work perfectly with influencer marketing, as influencers help promote your brand by offering their followers something in return. However, it can be a huge challenge to keep track of your giveaway since your influencers can reach millions of people. So you’ll naturally have thousands of participants. In some cases, the influencer themselves will host the giveaway so you wouldn’t need too much involvement. But if you’re hosting the giveaway, you can use giveaway and contest platforms, although they aren’t necessarily influencer marketing platforms. However, make sure your contest adheres to the Instagram promotional guidelines. Tools like Tagwin and Comment Picker are some excellent platforms you can use to choose winners of your giveaway contest. Depending on the kind of contest you’re hosting, you can also opt for Rafflecopter. While Instagram is a booming platform for running influencer marketing campaigns, what sets these campaigns back is the inability to add links to posts. So, even when an influencer promotes a certain product of yours, they can’t add a caption with the link to buy the product. And it can be a hassle to keep updating the link in their bio each time they create a new post. 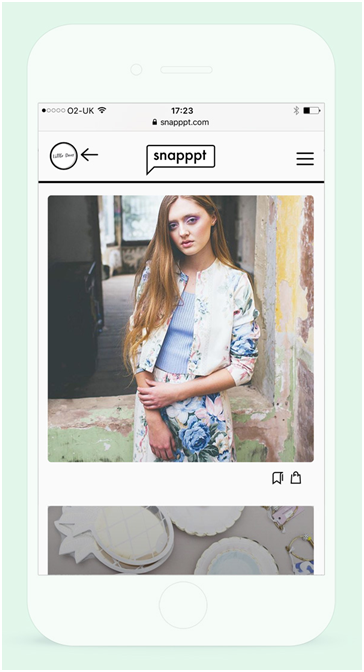 What you can do here is create a shoppable Instagram feed for each of your influencers. Platforms like Feedshop and Snapppt are perfect for this. Each influencer will have their own feed on one of these platforms, where they showcase your products with an option to buy them directly from the platform. They can share the link to their own shoppable feed in their bio. So their followers won’t have to go through a long process to look for your site and search for the products promoted by their favorite influencers. Instead, they can directly click on the link and go to a feed that resembles the influencer’s Instagram feed and then make their purchases directly from there. Not all the influencers you’re working with will deliver the kind of results you’re expecting. Some influencers may have a lot of followers but not drive enough likes for their sponsored posts. Some may be able to drive a lot of engagement but fail to drive any actions further than that. Others may be able to reach a smaller audience but drive a lot of actions that turn into conversions. So you need to keep a close eye on each of the influencers to determine which of them are driving the results you need and which of them are wasting your marketing dollars. The previously-mentioned Grin tool is excellent for keeping track of each influencer and what kind of results they’re driving. You can use influencer marketing platforms to monitor how the content created by influencers is performing in terms of reach, engagement, and more. This is essential because you can gain a clear idea of which influencers you should build a long-term partnership with and which of them you should avoid for future campaigns. Plus, you can also see if there’s a way to make improvements in the way an influencer creates content for your brand. Besides tracking individual influencer performance, you will also need to monitor how your campaign is performing as a whole. This will help you see whether the money you’re investing is delivering the desired results. And you can make adjustments to your campaign as required. While many influencer marketing platforms only provide basic features like influencer discovery, more comprehensive ones such as Grin and Revfluence have made it easier to monitor your ROI. And this is crucial because monitoring influencer marketing ROI is among the top challenges faced by marketers. Revfluence’s campaign monitoring feature helps you keep track of the number of posts created for your campaign. You can easily view KPIs like potential impressions, number of likes, comments, total revenue generated, etc. 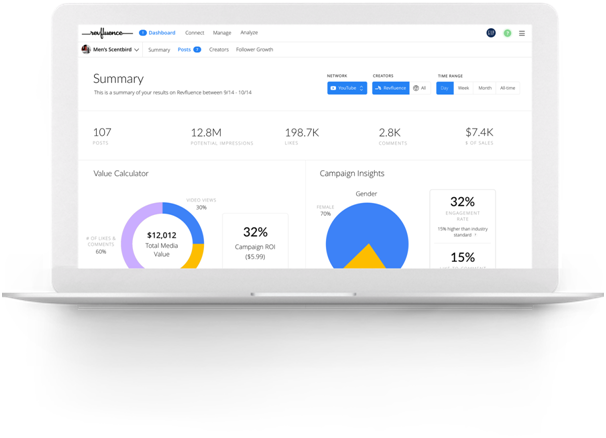 It automatically calculates your total campaign ROI and earned media value. These are some of the ways you can effectively leverage influencer marketing platforms for running your campaigns on Instagram. Now you can use these ideas to successfully execute your campaigns.